Abstract. This review is devoted to the obtaining of the continuous and discrete Euler-Lagrange equations for the attitude dynam- ics of a rigid body in SO(3). On that purpose, we introduce basics about Lagrangian mechanics, Hamilton’s principle, Lie groups, Lie algebras, discrete Mechanics, geometric integration, Variational In- tegratos and some of its geometric properties. 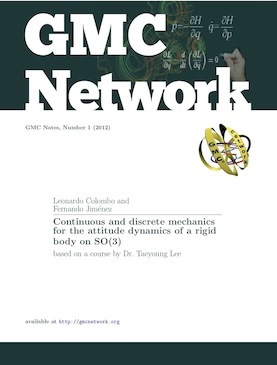 We present, quite exhaustively, the development of both continuous and discrete Euler- Lagrange equations for Lie group systems and, as particular cases, that ones concerning the rigid body and SO(3).